Macer was ecstatic with the results, he is already having visions of moving back to Italy! The day was good. For some inexplicable reason, Noctua has fallen out of favour with the Editor and was given the early session, with many of his gladiators being excluded. Mago & Kemsa got to fight in the evening session. Unfortunately, the governor Vespasianius could not make it, he was called away to Rome as there was a great fire. Many have said the whole city is burnt to the ground, and collapse of the Empire is imminent. In his place were the Governors two sons, Titus in his mid twenties, and young Domitianus, barely a teenager. “A hopeless lot” grumbled Macer, “The whole family is destined to obscurity!”. Titus seemed appreciative of the efforts of Mago and is an avid “parmulari”, preferring the light gladiator style. Young Domitianus on the other hand was completely unimpressed at the crowd granting missio to the losers, he only cheered when a death occurred. Mago earned 4 gold, and Kemsa 2. Mago’s total savings is now 10 gold, and Kemsa 6 gold. Neither could work out how the winnings are calculated. Again, Kemsa thought he did better but was paid less. In any event, there were wild celebrations in the ludus, with a week of drinking and other activities. So if you bet 5 gold on 2:1 odds, you will win 10 gold and get your 5 back, so 15 gold. Aquilinus has the highest reputation, having raced in the Circus Maximus. The gold team is a new creation of the governor, created at the behest of his young son Domitianus, as gold is one of his favourite colours, and he tires of the standard team colours. The golds have also employed an experienced Italian charioteer in Murena. Himilcar is the local racer, though he is not credited as having much chance. Mago approaches Samasu in a rare moment when he is amongst the gladiators. Samasu seems happy to see Mago, giving him a warm embrace. Mago gives over the 1 gold for any information (good suggestion). Samasu says “word on the street is that the Sicilian will win, but I am not sure, there are many different interests involved”. Let me know what Mago (and Kemsa) might want to do. If Mago bets big on the outsiders Eleazar or Himilcar, he can in theory repay most if not all the debt to Macer! Or take Samasu’s tip and bet on Apollinarius, though nothing is certain, gambling is risky business…. You can also bet on more than one chariot. Mago went away from the chat with Samasu perplexed. In the end, not really any the wiser, he decided to place bets as follows: on Blue (Apollinarius) 2 aureus, and on White (Himilcar) 2 aureus. Meanwhile Kemsa is baffled by the whole betting thing. The gossip in the gladiator barracks only confuses him. In the end he decides to listen to what the boss (Macer) has said, and he bets 2 aureus on Green (Hiram, not Aquilinus). Interestingly, Mago and Kemsa do not seem to have discussed the matter between themselves. It was a blistering hot day and the chariots lined up. 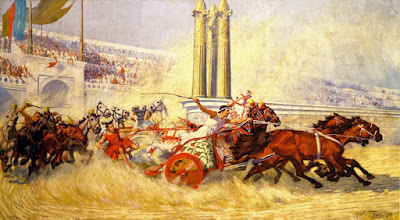 Unlike the gladiator fights, many in the crowd were decked out in the colours of their favourite chariot faction. The horse teams then dashed forward as the charioteers commenced their 7 laps. Something was clearly amiss with the favourite Aquilinus, the horse team seemed skittish and he had difficulty controlling them. Then the clumsy Himilcar clipped the chariot of Murena, who was sent crashing into the wall. The field opened up for Apollinarius to take the lead which he held to the end. A win for the blues! Mago spent 5 gold (1 to Samasu, 4 in bets) and won 8 (4:1 odds on the winner) plus his bet of 2. Overall, he nets 5 gold (10-5), so his total savings are now 15 gold. Kemsa’s savings drop to 4 gold. He is rather peeved that Mago won on the races and didn’t share his knowledge. Macer is also fuming that the greens lost, and supporters of the governor’s gold faction were cursing the local clumsy buffoon Himilcar. Time passed. There were big problems in the Empire. 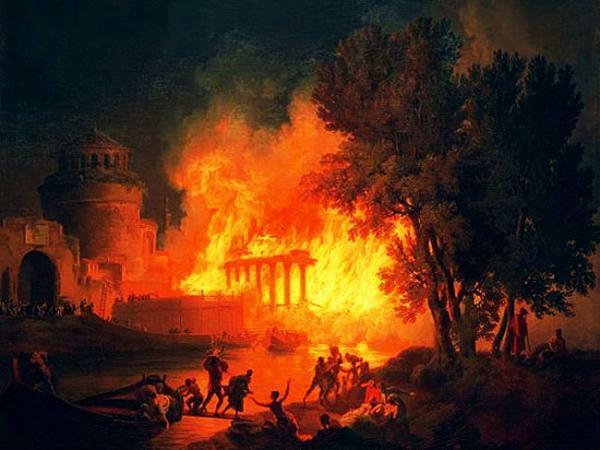 The dispossessed populace of Rome had to be appeased and the city rebuilt after the fire. Much money and resources are being drained from all provinces and news is filtering in of riots in some provincial capitals. 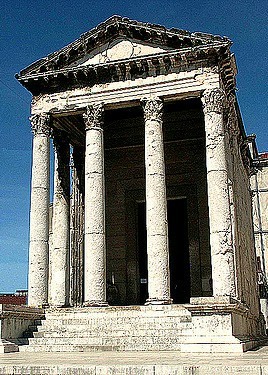 It was decided to hold games for the benefit and Rome (and to keep everyone happy), with a Festival to Jupiter (the patron god of Rome) being declared. A great “pompa circensis” would be held beforehand, starting at the Temple of Roma and Augustus in the city, moving along the roads and ending in the amphitheatre. Mago is up against Murex, in quite an unusual match up. The showman Murex is from Noctua’s ludus, who is back in favour, and has 3 skills – Popularity, Dodge, Reflexes. It is unknown how this match occurred against the crowd favourite Murex, but it is suspected that Noctua wants to clip the upcoming star Mago of Macer’s ludus. Kemsa is up against Pertinax, who was Mago’s opponent from the first game. Pertinax has since won a fight in the last games and has gained the Attack skill. Don’t forget the second skill both Mago and Kemsa picked up. For 2nd skills Mago has drawn "Reflexes" and Kemsa has drawn "Attack". This fight looked for a while like it would be Mago's last. 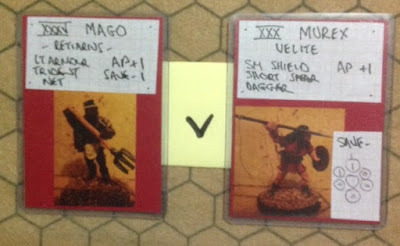 Both gladiators initially circled each other, scoring small hits, but then Murex (who preferred using his Hasta at close range rather than throwing it) scored a big hit, Mago lost 5 strength in one go and was wounded (down to his red strength markers). But then he was able to recover from a knock down, and somehow managed a couple of reasonable hits on Murex, taking him down to the red markers also. Both had also accumulated various fatigues by now and were in danger of becoming exhausted [or "tired" as the sophisticated would say ;)]. Murex decided to fall back and try to catch his breath (use no AP, reduce fatigue level) and Mago was inclined to do the same. But then Mago threw 6AP and launched a final desperate attack. First he knocked down Murex who also lost his shield. Murex struggled back to his feet but Mago was ready and delivered a final blow. Murex's popularity with the crowd, and the good show he put on, ensured he was spared by the crowd. Mago: lost 7/9 strength, 2 fatigue, Vincit (Won). Murex: lost 9/9 strength, 1 fatigue, Missio (Lost but given Mercy). This round proved a tough fight for Kemsa also and he had to come from behind to win. An early side attack on Pertinax was saved by his armour (would have inflicted 5 if successful! ), and Pertinax capitalised on this escape by taking three strength off Kemsa, who seemed unable to land another blow and was building up fatigue. 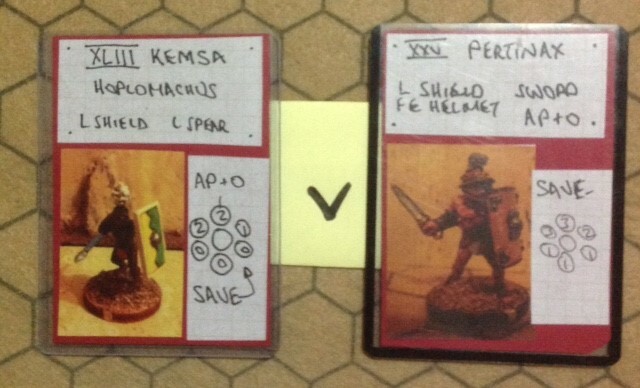 But then Kemsa knocked Pertinax down and he also lost his fully-enclosed helmet, and was too groggy to get up again. Kemsa fluffed his next attack, merely pushing Pertinax away, but he could still not get back on his feet. Then Pertinax also lost his sword and still could not get up, and Kemsa was finally able to score a big hit (inflicted 5), followed next move by Pertinax appealing to the crowd (absolutely terrible run of AP dice by Pertinax). Also he threw just enough for his appeal to the crowd to succeed - 1 less and he would have been toast. This Leptis Magna crowd seems a bit on the "soft" side! Kemsa: lost 3/9 strength, 3 fatigue, Vincit (Won). Pertinax: lost 7/10 strength, 1 fatigue, Missio (Lost but given Mercy).